Pokhara—Bhimsen Bhujel has been elected chairman of Restaurant and Bar Association Nepal (REBAN) Pokhara. The 13th convention of REBAN Pokhara also elected 15-member new executive body in Pokhara on Friday. As per the information, Laxman Baral has been elected first vice chairman of the association. Similarly, Yogesh Bhattarai in second vice chairman, Ganesh Thapa in general secretary and Luk Gurung in treasurer also are the part of the new committee. Likewise, Bikash Bhattarai has been picked as secretary while Roshan Karki has been elected joint treasurer. 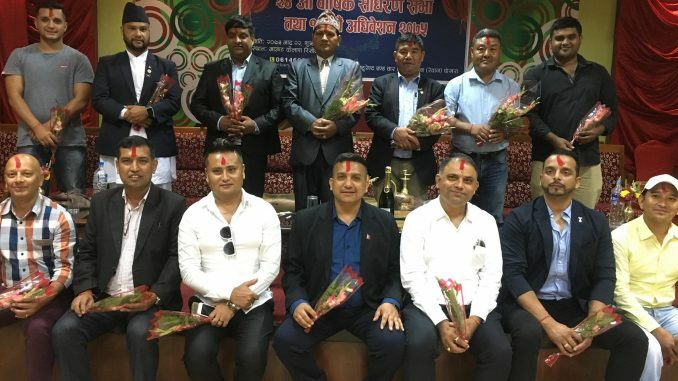 Bishwo Raj Paudel, Naresh Bhattarai, Rajendra Dhakal, Bharat Sharma, Basanta Gautam, Baibhav Paudel and Dil Shrestha are the members of the new executive body. Chau Bahadur Gurung is the immediate past president of the committee.